Busch Stadium is the site of the matchup between the Cincinnati Reds and the St. Louis Cardinals on Wednesday, September 13, 2017. The probable starting pitchers are Tyler Mahle for the Reds and Jack Flaherty for the Cardinals. Cincinnati opens at +155 while St. Louis opens at -165. The Reds have a 76-63-5 over/under record and a 73-71-0 run line mark. The Cardinals are 70-73-0 against the run line and have a 72-63-8 over/under record. The Reds have a 62-82 overall record this season. Starting pitcher Tyler Mahle has a 0-2 record with an earned run average of 3.60 and a WHIP of 1.53. He has 10 strikeouts over his 15 innings pitched and he's given up 15 hits. He allows 9 hits per 9 innings and he has a FIP of 4.02. The bullpen has an earned run average of 4.61 and they have given up 517 base hits on the year. Teams are hitting .248 against the bullpen and they've struck out 539 hitters and walked 233 batters. As a team, Cincinnati allows 9.2 hits per nine innings while striking out 8.3 batters per nine innings. They are 29th in the league in team earned run average at 5.23. The Reds pitchers collectively have given up 1,307 base hits and 740 earned runs. They have allowed 230 home runs this season, ranking them 1st in the league. Cincinnati as a pitching staff has walked 546 batters and struck out 1,170. They have walked 3.9 men per 9 innings while striking out 8.3 per 9. They have a team WHIP of 1.46 and their FIP as a unit is 5.11. As a team Cincinnati is hitting .255, good for 16th in the league. The Reds hold a .435 team slugging percentage and an on-base percentage of .332, which is good for 11th in baseball. They rank 16th in MLB with 8.7 hits per game. Joey Votto is hitting .313 with an on-base percentage of .448. He has 156 hits this season in 499 at bats with 93 runs batted in. He has a slugging percentage of .577 and an OPS+ of 166. Adam Duvall is hitting .249 this year and he has an on-base percentage of .297. He has totaled 133 hits and he has driven in 95 men in 535 at bats. His OPS+ is 102 while his slugging percentage is at .495. The Reds have 1,249 hits, including 223 doubles and 197 home runs. Cincinnati has walked 516 times so far this season and they have struck out 1,161 times as a unit. They have left 1,027 men on base and have a team OPS of .767. They score 4.76 runs per contest and have scored a total of 686 runs this year. St. Louis has a 75-68 overall mark this year. With an earned run average of 6.00, Jack Flaherty has a 0-0 record and a 1.78 WHIP. He has 10 strikeouts over the 9 innings he's pitched. He's also given up 11 hits. He allows 11 hits per nine innings and his FIP stands at 5.48. The bullpen has an earned run average of 3.96 and they have given up 426 base hits on the year. Teams are hitting .247 against the Cardinals bullpen. Their relievers have struck out 447 batters and walked 156 opposing hitters. As a team, St. Louis allows 8.6 hits per nine innings while striking out 8.3 batters per nine innings. They are 7th in the league in team earned run average at 3.86. The Cardinals pitchers as a team have surrendered 1,226 base knocks and 550 earned runs this season. They have given up 160 home runs this year, which ranks 27th in Major League Baseball. St. Louis as a staff has walked 427 hitters and struck out 1,185 batters. They give up a walk 3 times per 9 innings while they strike out 8.3 per 9. Their team WHIP is 1.29 while their FIP as a staff is 4.06. As a team, they are batting .259, good for 12th in the league. The Cardinals hold a .430 team slugging percentage and an on-base percentage of .335, which is good for 7th in baseball. They rank 14th in MLB with 8.8 hits per contest. Matt Carpenter comes into this matchup batting .238 with an OBP of .376. He has 107 hits this year along with 64 RBI in 450 AB's. He maintains a slugging percentage of .436 with an OPS+ of 114. 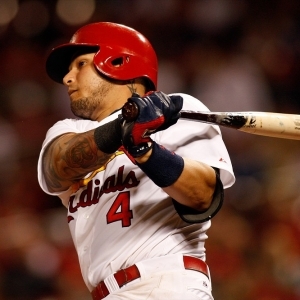 Yadier Molina is hitting .280 this season and he has an OBP of .316. He has collected 129 hits in 461 at bats while driving in 72 runs. He has an OPS+ of 98 and a slugging percentage of .445. The Cardinals as a unit have 1,253 base hits, including 255 doubles and 174 homers. St. Louis has walked 512 times this year and they have struck out on 1,196 occasions. They have had 982 men left on base and have an OPS of .765. They have scored 4.74 runs per game and totaled 678 runs this season.